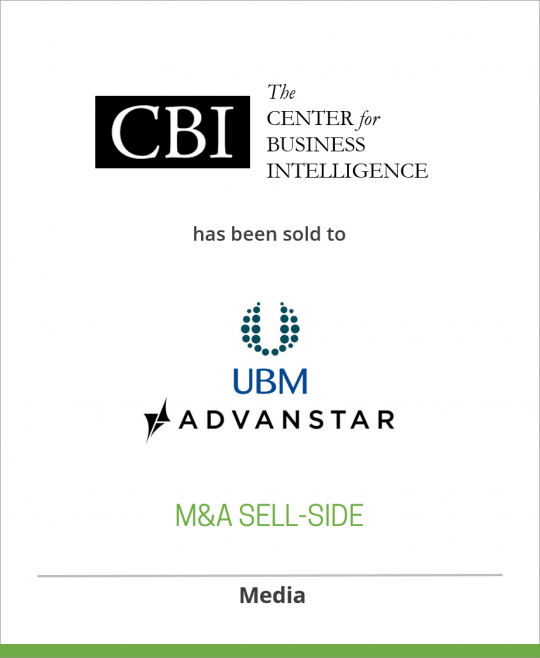 CBI Research, Inc. Sold to Advanstar Communications Inc.
CBI Research, Inc. has been sold to Advanstar Communications Inc.
CBI Research, Inc., a provider of live/electronic conferences for senior executives in the pharmaceutical and biotech industries, has been sold to Advanstar Communications Inc. Founded in 1994 in Massachusetts, CBI Research, Inc. is dedicated to developing market-driven, unbiased conferences in pharmaceuticals\biotech, medical devices, risk and insurance and managed care markets. CBI Research, Inc. offers conferences and summits that serve senior executives and government officials by providing a unique platform for highly focused content and presentation. As a delegate, speaker or sponsor, you receive timely information on the latest investment opportunities, business strategies, domestic and international regulatory issues, operations and applied technologies. Our events provide you with concrete, real life examples that you can begin to apply at your organization immediately for significant impact on costs and revenue.Plus, there are extensive opportunities for networking and discussion with senior policy and decision makers. Advanstar Communications Inc. is a leading worldwide media company providing integrated marketing solutions for the Fashion, Life Sciences and Powersports industries. Advanstar serves business professionals and consumers in these industries with its portfolio of 91 events, 67 publications and directories, 150 electronic publications and Web sites, as well as educational and direct marketing products and services. Market leading brands and a commitment to delivering innovative, quality products and services enables Advanstar to “Connect Our Customers With Theirs.” Advanstar has approximately 1,000 employees and currently operates from multiple offices in North America and Europe. Veronis Suhler Stevenson is a private equity firm that invests buyout and structured capital funds in the media, communications, information and education industries in North America and Europe. VSS provides capital for buyouts, recapitalizations, growth financings and strategic acquisitions to companies and management teams with a goal to build companies both organically and through a focused add-on acquisition program. To date, VSS equity and structured capital funds have invested in over 58 platform companies, which have in turn completed over 245 add-on acquisitions resulting in a portfolio with realized and unrealized enterprise values in excess of $2.8 billion. sold to Advanstar Communications Inc.